1.From time immemorial, butterflies have always fascinated humankind and no group of insects is more charismatic than the butterflies. Among insects they are certainly the most popular, and that is probably why they are among the most studied insects. Today several species of butterflies are used by conservation biologists as indicator species to identify habitats that are critical and need to be protected. Butterflies are also monitored to ascertain degree of purity, climate change and environmental degradation. 2.Their size ranges from the tiny jewels to gorgeous Bird wings with a wing span as great as eight inches. Almost all Indian butterflies are under threat, and some are critically endangered. Reason being their food plants and nectar plants which are mostly found in the wilderness. Large areas, once forest or wasteland, full of wild plants that caterpillars eat, have now been cleared for agriculture, besides their habitat loss the widespread use of insecticide has drastically reduced numbers. But a butterfly lover and nature lover finds its way and so did we. We created our own one of a kind ?The butterfly garden?. We have reared more than 373 of them till date. 3.During our brief interaction with Shri Isaac Kehimkar at Oavlekar Wadi(Thane, Mumbai) we were so fascinated by the winged jewels that we thought to have a closer look of these species. Shri Isaac Kehimkar and Sqn Ldr Girish Dantale are our inspiration in this wonderful world of colourful species. 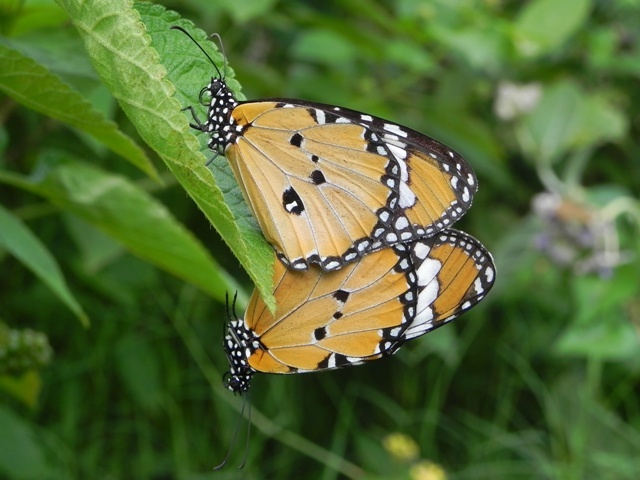 4.During our stay in Mumbai at Mankhurd( in 2009-11), we thought of having a closer look i.e the life cycle of the butterflies, to appreciate this wonderful creation of God. Book on Butterflies by Isaac Kehimkar was of paramount help to us in knowing their behaviour, but our quest started with finding information on the food plants of different butterflies. Then we started looking at the food plants, but it seems we were searching needle in hay stack. We narrowed down our search by looking at the caterpillars. The first thing we saw was Lime butterfly laying eggs on lemon plant in our garden. 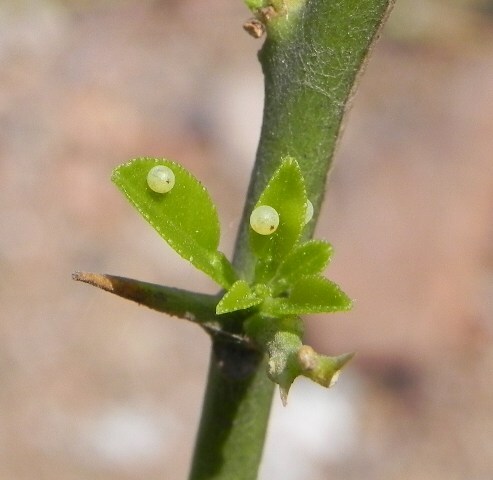 We saw it was just 2 mm spherical white/yellowish ball, underneath the fresh leaf. Fortunately we could capture this phenomenon. Next few days we monitored the egg and witnessed the growth of caterpillar and our joy grew many folds. But nature had something very important in store for us. Around eighth day when we went in the morning to see the beautiful being, we were shocked to see it was eaten by Myna who has positioned herself near a tree. It took us some time to understand law of nature. We decided not to take a chance with the next few eggs left with us. 5.Very next day we bought some lemon plants from nursery to our home and transferred the freshly erupted caterpillars on it and started monitoring the activities. There was different kind of environment in our home i.e. we both were excited and equally ecstatic to receive the new born in our family. Very soon it became our family member. We had only one thing to discuss, that was ?the activities of caterpillar?. The life of caterpillar revolved around eating leaves of the lemon plant and excreting. Our prime focus /centre of gravity of house was caterpillar. The life cycle is quite fascinating. We started reading Book on Butterflies to understand their metamorphosis. Nothing was known to us, everything was new and we were quite apprehensive about the behavioural pattern. Rearing blue tiger was quiet a challenge due to its food plant which is wild creeper. Daily we bought fresh leaves for the caterpillers to our home and cling them on thorns of lime tree. 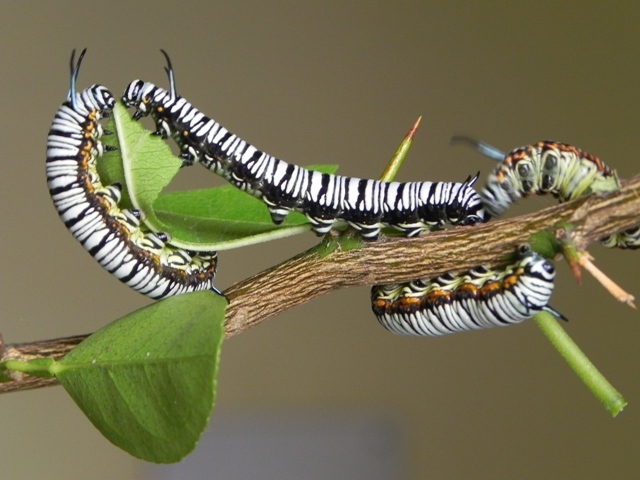 Caterpillers are genetically tuned to the environment they face as there mother`s contribution is to lay them under the fresh blooming food plant leaf. After rupturing they are own their own. Blue tiger food plant is smooth wild creeper but when we shifted them with few leaves on lime tree they beautifully tuned themselves and without eyes successfully completed their tenure as caterpillar. We reared common mormon, lime butterfly, blue tiger,Memphis Proserpina, danaus plexippus,brown king crow, glassy tiger. Our lives revolved around the little one. Thereafter when we reached Visakhapatnam, we started our journey with Plain Tiger, and later could manage great mormon. We had only seen the mighty mormon in flight and it came as surprise as we thought the caterpillar resembled common mormon. 7.Soon after mating, the adult female starts searching for an appropriate food plant to lay eggs. The underneath of fresh leaf egg is protected from predators, harsh sunlight and soft leaf is gift from their mothers to start there journey. The number of eggs laid by female numerous for ensuring maximum survival. 8.It takes 3-5 days to hatch. The caterpillar emerges from the egg, and first thing it eats is the egg shell. Thereafter it just scrapes off the soft bud/under surface of leaf, till it gets his jaws stronger to feed on leaves. It spends much of its time in eating whatever comes its way viz bud, leaves, flower and shoot of the plant. Basically it is eating machine. 9.Curiosity led to another finding when we touched the caterpillar. To our surprise it had another weapon to show its might and fight the perpetrators. Two tentacles producing pungent liquid. These tentacles emit pungent smell, which acts as deterrent.? And when threatened, they cajole themselves, exposing minimum area for exploitation. 10.They become restless if they don?t find the food. The urge to get food, makes them adventurous and explorer. One of the restless/adventurous caterpillar came down the plant and hid behind the TV cabinet. We kept on searching for the 3-4 hours early morning, but all in vain. We started making list of predators who could be available in the protected vicinity of the house and the lizard was on our hit list for the time being. but our house had no trace of lizard, then who else?. So we rejected this hypothesis and with our limited detective traits started searching for the caterpillar. After one day?s extensive search, when we gave up and started praying for its soul to rest in peace the naughty caterpillar came in the limelight no less than an awaited celebrity walking on the TV table. Maybe his hunger drove him outside the cabinet and we made him reach again on the plant like the crowd and photographers pave the path for a glimpse of celeb. We heaved sigh of relief. 11. The Caterpillar stage lasts 8days to maximum/depending on weather, food availability and not to forget the predators. It is a hidden development stage and starts with pupation. The stages are, caterpillar to pupa transition, Pupa and change in color a night before becoming adult. 13.A night before emergence, the pupal case becomes transparent, allowing the colours of the butterfly wings to be seen. By dawn the colors get darken and pupal case spilts open at the head. One of the remarkable phenomena is butterfly coming out, of the pupa. 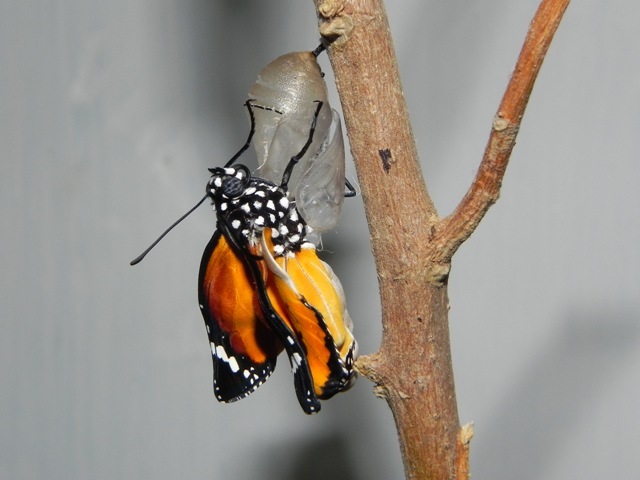 14.First pupa, we missed butterfly coming out as we were not aware of the phenomena. 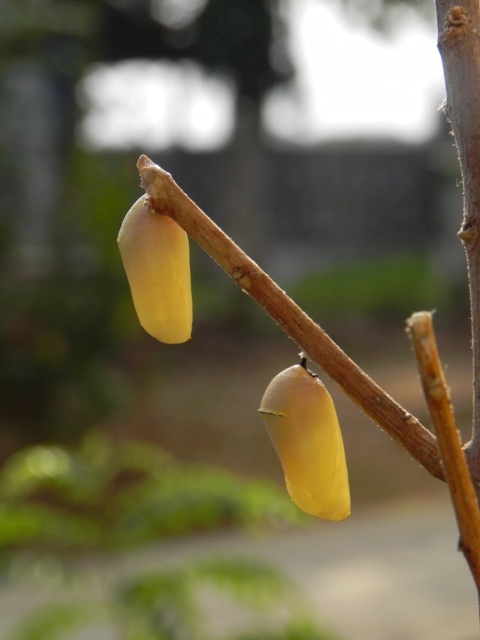 But in the second case we noticed changes in the pupa night before coming out. But that too we missed. Finally third Pupa gave us opportunity to record the butterfly coming out. And that achievement completed the life cycle recording. 15.So far our journey from Ovalaker?s Vadi and brief introduction with Shri Isaac Khemkar, to this day has been studded with winged jewels. Had it not been the encounter with these venerable flying angels, our life would have been less fulfilling. I respect owner?s grit and determination to carry on with the development of one of a kind butterfly garden without any expectations for returns. 17.They are harmless species. Their existence is endangered and their survival is critical and needs to be protected. Let us start giving life to these species. If one in 10 can nurture one butterfly, the balance in the ecosystem will increase the survival rate of other species. Just wander, search for the eggs in the vicinity of your house (look for the tiny white dots), bring it home along with the food plant leaves and serve them daily. Nature is full of miracles with variety of living beings with uniqueness intact whether it is mighty elephant or fragile Lepidoptera. Mother of these young ones does not have time for parenting so, nature has designed them self sufficient. Law of nature is unassailable especially in the wilderness. (The authors have reared more than 400 butterflies in their home garden and journey still continues. They have inspired neighbours and their children and they have started enjoying the life cycle and this cyclic effect continues for the betterment of this ecosystem.